Today I thought I’d do something a little different. I was about to head out west for yet another few hours of trail bashing in the Waitakeres when I thought to myself “time for a change”. Instead I headed over the Harbour Bridge to the North Shore (fortunately I remembered my passport too). I have on occasion run a few of the trails that traverse the various parks around this part of town but today I discovered some new ones. It started quite by accident when I took a wrong turn and found myself in a park I’d never seen before. A quick look at the handy dandy Information Board revealed what looked like a nice little trail following a stream that would link up with where I had planned on driving to – eureka! new trail! Without another thought I parked and started exploring. It turned out to be a great wee bush trail, just minutes from the Bridge. I was a happy man. This set the tone for the run. I abandoned any attempt at using my rough map of the area and instead just followed my nose, navigating by the sun and instinct alone. What an incredible network of trails there is in this neck of the woods! Sure, some of them were familiar but several were completely virgin territory for me. One thing they all had in common though was they ran through gorgeous stands of native bush. To find this much pristine native flora so close to the heart of Auckland city never ceases to amaze and impress me. The photo above is taken at a beach that lies almost directly across the harbour from where we live. I must have seen it in the distance thousands of times and yet I had never been there before! Just seeing it up close, gazing back across the water to my own suburb, was every bit as much a discovery as heading into a new piece of back country for the first time. So the moral to this tale is clear – Never Stop Exploring. This run started and finished 10 minutes drive from my house. I never expected such a journey of discovery could be so close by and it reaffirmed for me what is core to my love of trail running. Quite simply it’s a great way to explore. And this in turn brings new experiences, new places, a sense of rejuvenation even. No coincidence then that the Running Wild tag line is ‘Run, Explore, Share’. 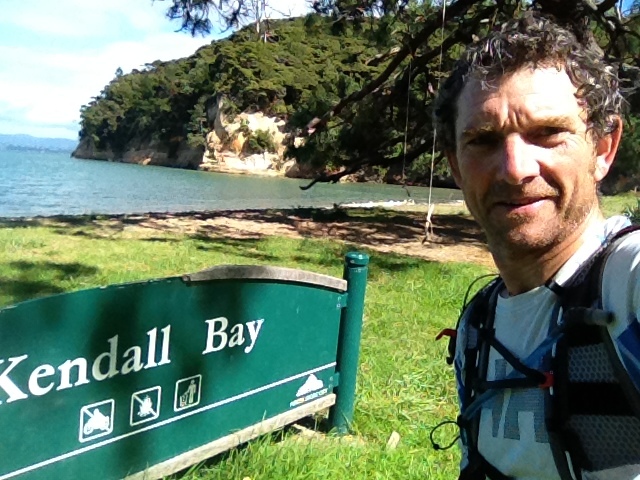 This entry was posted in Great runs and tagged Auckland trails, New Zealand, trail running. Bookmark the permalink. Great reminder about the adventure of exploring. Thanks for the map Wayne – most useful!